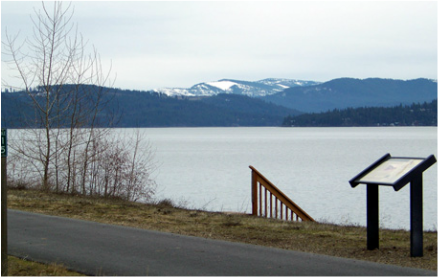 Lake Coeur d'Alene waterfront within Harrison boundaries (click for map location). Access: Public. Trail of the Coeur d'Alenes, a non-motorized paved recreational trail. Take Harrison St. down the hill from Lake Ave. and start the tour at the Gateway Marina. Harrison was perched on the edge of a vast timber belt. Trees were cut down with crosscut saws and sent down chutes and flumes into the water. They were gathered into brails and pulled to lakeside lumber mills by tugboats. Thousands of logs floated in booms off the Harrison shore, which was crowded with mills and box factories. The remains of some of those businesses are still visible. 1 - Grant Lumber Co. (click for map location). Access: Business/Public. Gateway Marina, Lakeside Bar & Grill, HI Water Adventures, Inc. public beach and docks. Fred and Ernest Grant purchased the Fisher Brothers mill and barged it to Harrison from St. Maries, Idaho, in 1893. It was equipped with planers, molders, stickers, and lath machines, and had its own electric light plant. By 1903 the mill had a capacity of sixty-thousand feet per day with a workforce of fifty men, not counting the loggers. A fire started here in 1917 that burned much of the town. Gateway Marina at the site of the former Grant Lumber Co. mill. Mills North of the Grant Lumber Co.
2 - Cameron Lumber Co. Martin Sexton moved his sawmill from Tensed in 1891, to the area below the present day Lakeview Lodge. This was probably the first sawmill in Harrison. The assets were merged with Cameron brothers' mill in 1893, which made Cameron Lumber Co. one of the largest sawmills in the region. The plant was partly burned in 1902. A Spokane Chronicle article of 1908 noted that the Wm. 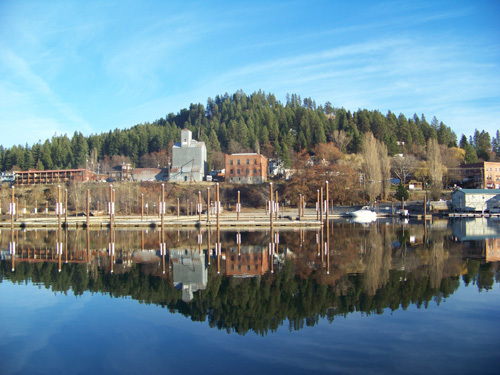 Musser Co. of Spokane bought the Cameron property and created one of the finest mills on Coeur d'Alene Lake. Musser Co. also bought the Crane Sorting Works at Harrison. A fire in 1913 destroyed the mill. 3 - Stuve Bros. Shingle Mill was on the waterfront below the present day Osprey Inn B&B from 1892 to 1902. The Stuve brothers came from Norway and established the first cedar shingle mill in Harrison. 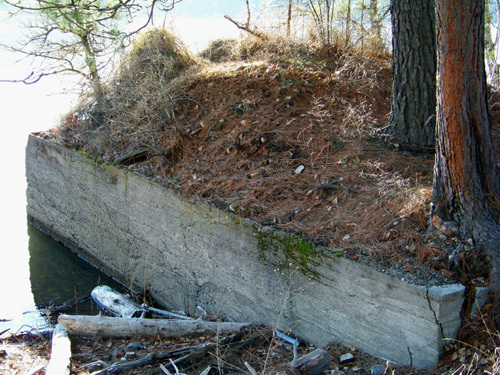 The remains of Stuve Bros. mill decompose into the landsape. 4 - Lane Lumber Company was toward the northeast city boundary between 1909 - 1913. Fred Herrick bought it and renamed it Export Lumber Co. He operated in this spot between 1914 and 1929, when bankruptcy forced him to sell off his holdings. The Export mill mostly supplied rough cut timber for the Coeur d'Alene mines. 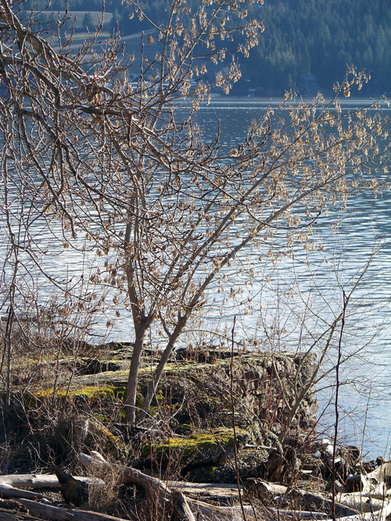 See the vestiges of the Export Lumber Co. in winter when the lake level is low. 5 - First Bridge. 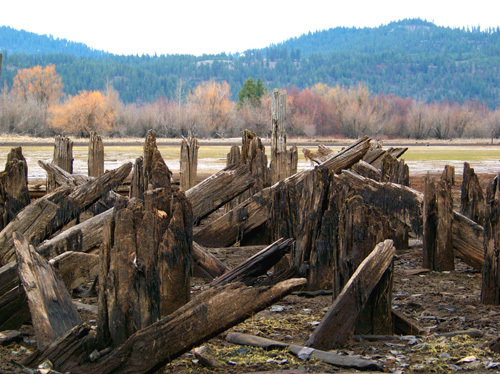 The pilings of the original bridge over the Coeur d'Alene River can be best seen from Hwy. 97 on the north side of the river when the water is low. It was built by Martin Gilbertson and was in operation as early as 1907. A second bridge was built in 1932 and was replaced in 2007. 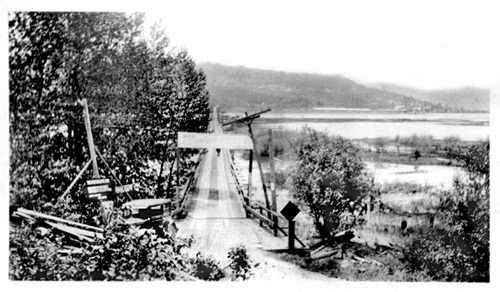 The original bridge over the Coeur d'Alene River. 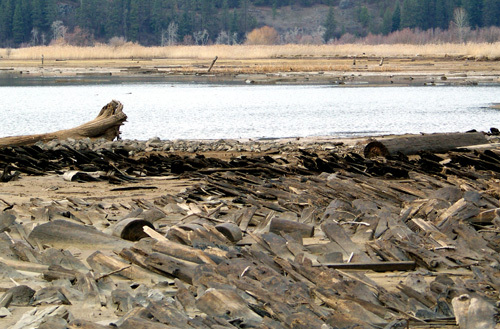 Supports of the original bridge across the Coeur d'Alene River, visible in winter when lake water is low. 6 - Avery Shingle Co. / Harrison Shingle Co. (click for map location). Access: Public. Harrison City Campground. Sam and Joe Avery and Herman Laumeister built the Avery Shingle mill in 1906. The remains are preserved in the city campground below One Shot Charlie's. The mill was destroyed by fire in 1915. Joe Avery and Brantner Brothers started rebuilding that December and Harrison Shingle Co. opened 1916. It suffered losses in the 1917 fire. The mill burned in 1919. It was rebuilt in 1923 by Herman Laumeister and burned again that year. The burner of the shingle mill that stood where the tent campground is now. 7 - Harrison Box & Lumber Co. William Gray and Lee Knutson established the business in 1900 below present day Rose St. It processed twenty thousand feet of lumber daily into all kinds of fruit boxes, and generated a pay roll of about $1,000 per month. 8 - Spokane Grain Company G. E. Thompson was awarded a contract in 1901 to construct a 40' x 160' building on Lakefront for the Spokane Grain Company, to be used as a flour and feed store. Train depot and steamboat stop below Lakefront Ave.
9 - Harrison Depot. A wooden boardwalk led down the trail from the former Hotel Harrison on Lakefront Ave. to the site of the train depot and steamship docks. Two floating businesses -- Jim's Confectionery and Pete's Dockside Restaurant -- served travelers. One of these businesses was described in a Searchlight article as being there in 1946: "Beside the dock sat a dingy old building that housed a little restaurant and beer parlor run by Mr. and Mrs. George Anderson." During Harrison's heyday, a thousand people came through here on the trains and steamboats. 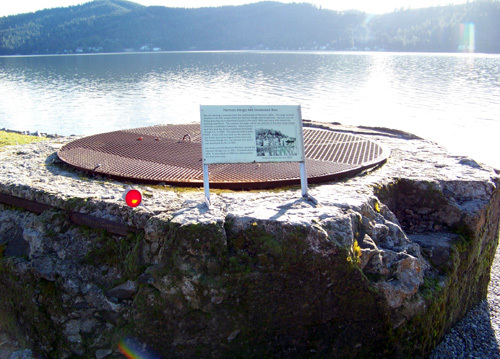 An interpretive sign marks the site of Harrison's former train depot and steamboat docks along the Trail of the Coeur d'Alenes at milepost #15. 10 - Conelly & Kroetch Stull Works made timbers for the mines from 1909 to 1962. 11 - The Empire Mill operated from 1900 to 1903 by Albert G. Kroetch and Lawrence S. Kroetch. 12 - Northwest Box and Lumber Co. operated from 1894 to 1895. 13 - Russell & Pugh Lumber Co. The elder C.W. Russell operated the original mill here from 1895 to 1902. It had a capacity of twenty-five thousand feet per day and employed about twenty-five men with a total monthly payroll of about $1,200. The mill's first sale went to the Coeur d'Alene mines, which remained their best market. After 1902, Walter Russell, Guy Russell, and John Pugh took over ownership. A band saw was installed in 1909. It was the first one in the area to replace the huge old circular saw. The mill burned in 1918, after which the entire operation was moved to Springston, Idaho. When the mill closed in 1964 it was the oldest operating sawmill company in Idaho. 14 - Eureka Shingle Mill was barged from Cataldo, Idaho, in 1898 to the area slightly north of the present City of Harrison shop. The principle owner was George D. Brown of Tekoa. A big fire destroyed the mill and two Northwestern freight cars on a sidetrack in 1899. Harrison Box Co. was on this spot from 1913 to 1922 . 15 - St. Joe Lumber Co. was built in 1900 and reached a capacity of fifty thousand feet per day. Fifty men were employed with a monthly payroll of $2,500. It was destroyed by fire in 1908. In 1913, Duluth Lumber Co. purchased the site and operated a mill here until it was destroyed by fire in 1916. These mills stood across from a clearing in the woods, known as the Gabouray homestead. People alternately called this the St. Joe Mill or Lakin Lumber Co. These were the southernmost mills on the waterfront within Harrison city limits. Additional mills reported by Crane Historical Society, locations undetermined. Sawmills: Bacon, Beaton, A. Buckley & Son, E.C. Burton, C.W. Crow, Duluth Lumber Co., George Lamb & J.C. Buck, Rowe Bros., St. Maries Lumber Co. Shingle Mills: Baker & Co., Herrin & Bacon, Idaho Shingle Co.
(Sources: Harrison Waterfront Map, by Bert Russell, 1965; Images of America: The Harrison Area, by Crane Historical Society; An illustrated history of north Idaho: embracing Nez Perces, Idaho, Latah, Kootenai and Shoshone counties, state of Idaho; photo of Harrison Idaho waterfront, taken 1903 with waterfront businesses identified in the caption; Spokesman-Review and Spokane Daily Chronicle archives, write up by Crane Historical Society). If you have corrections or additional information about the historic Harrison waterfront, please fill out the form. Please use "Waterfront" as the heading to your comment and specify the number and name of the item you are referring to, or say "other". Thanks much!